The American Thyroid Association® (ATA) is the world’s leading professional association of medical specialists dedicated to education and research to improve thyroid disease prevention, diagnosis and treatment; improving thyroid patient care; and educating the public about thyroid health and diseases. VideoEndocrinology™ delivers high-quality peer-reviewed videos of cutting-edge surgical and diagnostic imaging procedures covering thyroid, parathyroid, and adrenal tumors and diseases, with minimally invasive, robotic, and open surgical procedures. This rapid publication videojournal offers a dynamic new venue for physicians and surgeons to share their techniques and showcase new approaches. VideoEndocrinology™ is included with your subscription to the monthly flagship Thyroid®. 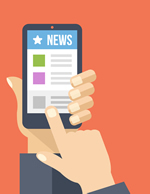 Signal eNews, sent monthly by email to American Thyroid Association® members, is a newsletter covering Association news, meetings, policies, leaders, and important thyroid-related issues. Clinical Thyroidology® for the Public summarizes selected research studies discussed in the previous month’s issue of Clinical Thyroidology®, an official publication of the American Thyroid Association®. The Laboratory Services Committee of the American Thyroid Association (ATA) conducted a survey of ATA members to identify areas of member interest for education in pathology and laboratory medicine. In response to the results of the survey, the Lab Service Committee developed a series of educational materials to share with the ATA membership. The topics were ranked as high educational priorities amongst the membership. 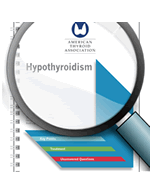 For more information on the survey findings, see Thyroid, Vol. 27, No. 12. The American Thyroid Association® (ATA) has launched its Thyroid Calculator mobile app currently available from the Apple iTunes App store for use on the iPhone and iPad. The thyroid calculator combines three key thyroid assessment tools that medical, endocrinology, and thyroid professionals can use for rapid calculation of: Calcitonin and Carcinoembryonic Antigen (CEA) Doubling Time; Change in Thyroid Nodule Volume; and Thyroid Cancer Staging. 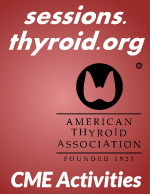 The American Thyroid Association® Session Recordings are a compilation of video recordings and synchronized slides for ATA Annual Meetings, CEU, and ATA® Symposia. Additional information on purchasing and accessing the session recordings can be found at http://sessions.thyroid.org. 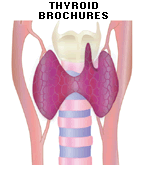 Thyroid Information The ATA® has designed this information to aid in better understanding about thyroid disease. Each topic has FAQs, or frequently asked questions, and a Patient Education Web Brochure.